……the start of a dream! A few years back when I was about to begin studying for my A Levels, I wrote to Roger asking for advice on how to achieve my dream of working as a physiotherapist in professional motorsport. I was thrilled when Roger replied, and the advice and inspiration he gave me has stayed with me ever since. Often if I have been struggling for motivation, or the path ahead hasn’t seemed as smooth as I’d hoped, I would always remember the advice he gave. Below is Rogers reply. Sincerest apologies for the delayed response to your letter, I hope that my advice is not too late and will assist your future thoughts. I, like your Father suggested to you. Originally started my career in the RAF as a Physical Training Instructor. However, after several years realized that this was not the career path for me, I left the RAF and retrained as a Physiotherapist. I would suggest that 1you follow your dream and thus. guide your subject choice towards being a physiotherapist. Hopefully your lecturers will have guided you to the best choice of subjects for this career path. However my recommendations are Human Biology. Maths, Psychology and Sports studies. In essence one of the sciences or a general biology based science will help for obvious reasons. Maths because of the mechanical nature of the job, psychology because of the people aspect of the job and sports studies to help with your focus towards sports physiotherapy. Some work experience will be invaluable so try and try to get this at your local NHS hospital. If you can-rot achieve this offer yourself as free service as a Physiotherapl helper. I hope this helps and also that it re-enforces the direction you have chosen. Nonetheless, if you have taken a different career path you should not worry, as you can change direction any time in your life. Essentially if you put your mind to it … you can do anything you want too, never limit yourself! I thought I’d give Roger an update on what I’ve been up to since, and how life has panned out for me! I went on to do well in my A Levels, and secured a place studying Sport Rehabilitation at St Mary’s University Twickenham. I’m currently about to begin my third and final year, and this is a course I love! The course covers everything a practitioner needs to know about assessing, treating and rehabilitating the injured athlete and I’m proud to say that I’m on track to achieve a First Class grade. Again, it was Roger’s advice that has driven me to succeed! As part of my course I’ve spent time on placement at Aldershot Town FC. Initially a 6 week placement, they’ve decided to keep me on and I’ve been returning for about 9 months so far and I’ll remain there for the rest of this season at least. Working closely with the physiotherapist and first team squad has helped develop my skill set massively, and working in professional football is a real buzz for me. Again, this opportunity wouldn’t have presented itself if I hadn’t followed Roger’s advice! Finally, this year I decided to attempt to break into professional motorsport, my true passion. I must have sent about 80-100 emails and letters, receiving just one reply. 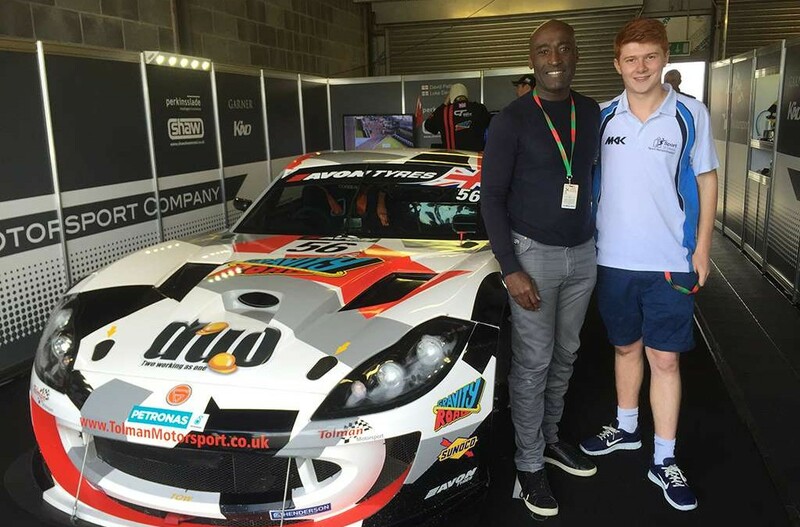 Tolman Motorsport, a relatively young British GT team took me up on my proposition, and I’ve spent the 2015 British GT season working with their two drivers. After incorporating soft tissue treatment, recovery strategies and even treating a handful of injured mechanics up and down the paddock, it appears they have been impressed with my work as they plan to retain me for next season in a paid role, with a medical budget! We’ve enjoyed a successful season, securing our first GT4 win at Brands Hatch and a podium at Snetterton this weekend in the Ginetta G55. This year has really been the breakthrough, and with plans for the team to possibly run two cars with four drivers next season, it should be an exciting year ahead! After completing my degree I hope to go on and study Physiotherapy at Masters Level, securing CSP status. Then I’ll see where life takes me! Once again, I can only thank Roger for the advice and inspiration he gave me.